In Chronicle number one of "The Church of God" series we saw that believers are given two sets of instructions: one, concerning the place they were in; and two, concerning the place where God lives. In the OT, they were in the land of promise which was their gift from God, and then they came to the temple at Jerusalem where God was. In the NT believers are in Christ through the gift of the Spirit of promise, and as God’s living temple of Christians come together in one place where Jesus the Lord is: the local church. We saw in chronicle #2 that God’s house was to be the gathering center in His Name alone – the Lord Jesus Christ. His people were to separate from all other names and only gather in His Name. The term "Name" has to do with God’s presence and conveys authority, unity and glory unto Him. Continuing to focus in chronicle #3 on the place where God lives, we will see that at "the place" one learns the fear of God. We have progressed to the third and fourth major purposes of God’s house which are highlighted below. Yes, the house of God has definite purpose to it. A biblical ‘purpose-driven church’ is not just having organized out-reaches, but one that understands God’s purposes in His house and is content with doing them unto Him. Understanding God’s purposes in His house will preserve the saints from putting their energy and time into man’s ideas and ways. Sometimes God’s purpose is so simple that we miss it, thinking man must be and do more. In Deuteronomy 14 God gave Israel instructions concerning where and why they must come with their families to the place where God put His Name. It was to "learn to fear the Lord thy God." God’s people were forbidden to just stay home and be thankful to God in their houses for His goodness unto them. At special times they were to tithe the increase of their seed unto the Lord at His place. They were also to bring sacrifices of appreciation unto God. By this act God’s people would learn that worship has "feet" to it; they had to go to the place. God is also worth sacrificing time and convenience for. They were further instructed that what they sacrificed to God must be the best of their flocks. If they had animals with blemishes or were lame or blind, they could not bring those to the Lord. They could eat those secondary animals within their personal city and family gates – but not bring them to God’s place. What brought the most value on the market was to be given to God. It became a sacrifice in the true essence of the word (Deut. 15:19-23). What is acceptable for normal use in one’s life is not always fit to bring unto God in His house. The fear of the Lord is the foundation of all true knowledge and education (Pro. 1:7). In our technological age there is much information but no wisdom of life. People are illiterate in the fear of the Lord. Fear can be a very positive thing. It can preserve life and guide right choices. Example: You see a toddler ready to stick a fork into an electrical outlet. You warn how he can be "fried to a crisp." The fear of harmful consequences can preserve his life. Remember, it is "By the fear of the Lord men depart from evil" (Pro. 16:6). It is at the house of God where a level of fear can be learned that can’t be learned elsewhere. Because God’s presence is there, there is an order and protocol present that will not be in a family or a personal relationship. "Eat before the Lord thy God, in the place … that thou mayest learn to fear"
… all the days that they shall live upon the earth, and that they may teach their children" (deut. 4:10). It was by coming to the place that one would observe the chosen order of the priests and learn separation from the common and unclean. At God’s house one would learn what is holy (to be used for Him) and what is unholy. It was at the house of God where they were to observe the discipline of sinning believers so "all the people shall hear and fear" (Deu. 17:8-11). It was at the place where men, women and children would hear the Word in a formal and reverent way so that they "may learn, and fear" (Deu 31:11-13). In order to have a good family in tough times, is it possible we have focused too much on the family? Have we have neglected the very thing that leads to strong families – a higher dimension of fear learned only in the house of God? Have we become so independent and family oriented that we have neglected God’s place? Psalm 77:13 teaches that "Thy way, O God, is in the sanctuary." Yes, the words of God can be learned at home but the "way" of God will be found at His house. Psalm 68:24-26 shows that the "goings" (procession or protocol) of God is found in the sanctuary of God. The children of Israel had been redeemed by blood and were on a pilgrimage moving through a wilderness toward their destiny of the promised inheritance. 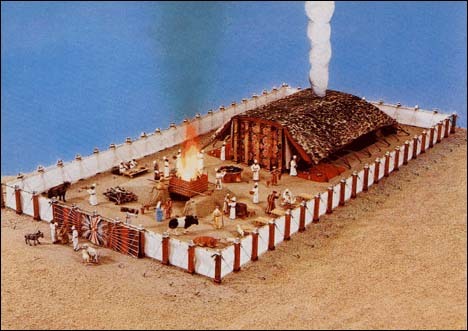 In the wilderness, Israel would find themselves encamped around the dwelling place of God: the tabernacle. 1Peter tells believers that we are redeemed by blood, pilgrims in this world, and part of God’s spiritual house on our way to our promised inheritance in heaven. 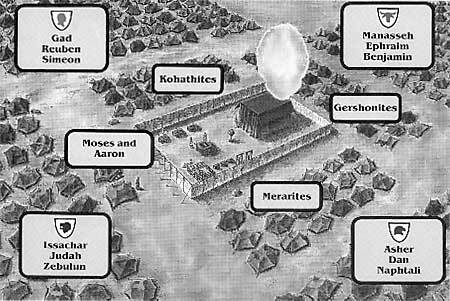 The large tent in the middle of the camp was the tabernacle (tent of meeting). It was God’s dwelling place. This was where worship-sacrifices and service occurred. The little tents were where individual families resided. The family tents only moved when the big tent moved. Wherever the big tent rested the little tents encamped. The family tents would only be anchored in relationship to where God’s tent was (Num. 9:15-23). Thus, the glory of God was in the midst of all the families where they could behold Him and His ways. The needs of the little tents did not control the movement of the big tent; rather, the big tent controlled the family’s movement. The family would learn the great principle of life: God is to come first in all things! The concept of fearing God is not confined to the Old Testament alone. God is the same God in the New Testament. Peter the apostle tells the Christians, "Fear God." (1Pet. 2:17). The word "fear" is the Greek word ‘phobeo’ used often in the New Testament with the common meaning, to be afraid. It is the same word used when the disciples were afraid in a storm. Christians are to understand that God is still a holy God and to be feared because there are consequences for disobedience. Yet in the New Testament gospel, the word ‘fear’ must be qualified. 1John 4:18 teaches, "There is no fear in love; but perfect love casteth out fear: because fear hath torment. He that feareth is not made perfect in love." Here the context is having boldness in the day of judgment. A believer will never face the wrath judgment of God for that has been dealt with at the cross – Praise our Lord! (1Thess. 5:12). We need not live in fear that we will be tormented for our sins. However, that is not to say the Lord should not be feared in the church. It is not to say there are no earthly consequences with a heavenly loss of reward. For example, one can drive a nail in a piece of expensive wooden furniture. While the nail can be pulled out, the mark remains. One might get in a drunken brawl and have his arm cut off. While he can be forgiven, the arm doesn’t grow back. If we have replaced the church meeting with family time, the youth group, the Sunday school, the Christian school, the Christian organization, and the counselors office, is it any wonder why our young don’t know the ways of God nor have the fear of God? Know ye not that ye [the church] are the temple of God, and that the Spirit of God dwelleth in you? If any man defile the temple of God, him shall God destroy; for the temple of God is holy, which temple ye are. (1Cor. 3:16,17). It is in the way of the local New Testament assembly that one can learn a high level of the fear of God. The early church saw many miracles and souls saved; the apostles had "great power" … "And great grace was upon them all" (Acts 4:33). Yet it pleased the Lord to carry out harsh discipline against sinning believers. This act provided a balance, for then we read, "great fear came upon all the church" (Acts 5:11). After, "believers were the more added to the Lord." Young Timothy is given instruction "how thou oughtest to behave thyself in the house of God, which is the church of the living God, the pillar and ground of the truth" (1Tim. 3:15). He’s instructed in church order and told that when there’s sin and it is investigated properly, those that sin he should "rebuke before all" (5:20). Why? "That others also may fear." To see the negative consequences of sin can also have a positive retarding effect on others as it creates a healthy fear. The local assembly in Corinth was told to live a life of separation from religious falseness and the unclean. Therefore, they were to cleanse themselves "from all filthiness of the flesh and spirit, perfecting holiness in the fear of God" (2Cor. 7:1). The best for God. God will judge believers’ works. Thus, Peter said to "Pass the time of your sojourning here in fear." Thus, they were to use their gifts "as of the ability which God giveth." Why? That God may be glorified. (1Pet.1:17, 4:11). Don’t be afraid of fear.